The Official Top Tips for IELTS gives you essential advice for each part of each of the IELTS exam for those studying the General Training module. 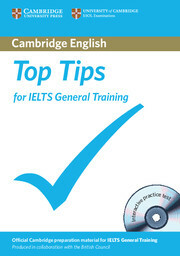 It is written by Cambridge ESOL examiners with many years' experience of setting and marking the IELTS exam and includes clear examples and explanations to show you exactly what each tip means, general tips for each paper and sections on how to revise and what to do on the day of the exam. The CD-ROM contains a complete, authentic IELTS exam paper so that you know what to expect when you take the exam.